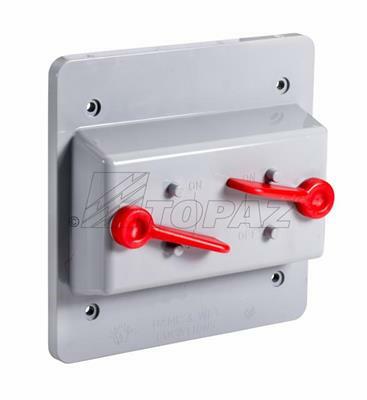 Topaz’s durable Schedule 40 PVC Double Toggle Switch Cover features a spring loaded lid with a weather seal gasket to keep out moisture and other damaging elements. Fits a double gang FS type box that encloses 2 standard 115 volt single or double pole switches. PVC construction maintains its integrity far longer than other materials and is highly resistant to corrosion from acids. Cover is weatherproof when closed; cULus approved.